Today’s meet in your kitchen feature means a lot to me, with great pleasure I visited the woman who established two beautiful culinary places in my adopted home of Berlin. One of them became my peaceful refuge as soon as it opened its doors a long time ago, in 1997. Barcomi’s Café and Barcomi’s Deli are both true gems, to me and many others who love good coffee and New York style cakes and sandwiches. 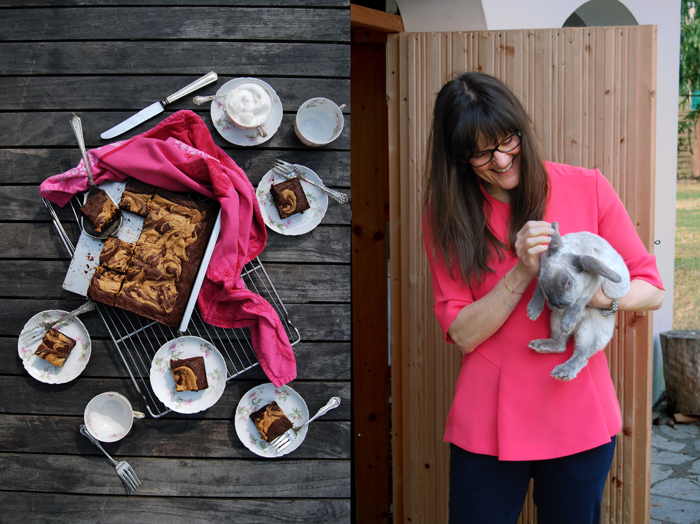 I was more than happy to meet the inspiring Cynthia Barcomi in her kitchen, to chat about her life, rabbits and chickens and to bake her delicious peanut butter brownies, what a perfect morning! 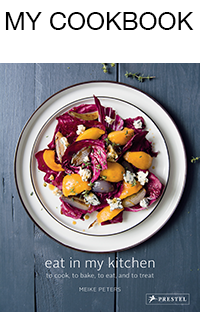 Over 20 years ago, Cynthia opened her first Barcomi’s in this ever vibrant city that’s seen so many changes in the culinary scene over the past two decades. She left New York as a professional dancer to live and work on this side of the Atlantic, in the German capital which was so different when she arrived compared to how we know it today. Cynthia is determined, a disciplined and hard working woman, so it’s no surprise that she successfully became a part of the Berlin dance scene. Although she enjoyed her life here, there was something missing: good coffee. This has always been a very delicate topic, all over the world, making coffee is an art, interpreted by different (objective) tastes. Berlin’s café scene in those days was a far cry from today’s diversity and Cynthia wasn’t particularly happy about her discoveries. She’s a woman of action, so she decided to roast her own beans and while she was already moving in this new direction, she also had the idea to sell some sweet classics from her American baking heritage. Her New York cheese cake, muffins, raspberry granache and pies, and her fantastic coffee of course, soon gained so much popularity that she opened a second Barcomi’s only three years after, a proper deli this time. Since I first sat at one of her Deli’s black and white tables as a traveling teenager it became my all time favourite café, a piece of my Berlin that I never wanted to let go of. So much so that I promised myself that I wouldn’t live too far away if I ever moved here, which I managed in the end. It may sound a bit silly, but in this hidden café, tucked away in an old yard, in the dreamy Sophienhöfe, I found a lot of what I was looking for in this city at that point. Although it’s a tranquil oasis, it also gave me the feeling that, here, I could dive deep into Berlin’s secrets by just sitting on one of the leather benches watching people come and go, drink their coffee or wine, read a newspaper or have a chat. I’d just have to sit and watch attentively. So after all these years, to find myself right in her kitchen is both a surprise and a gift, I can bake with one of my early baking heroes! 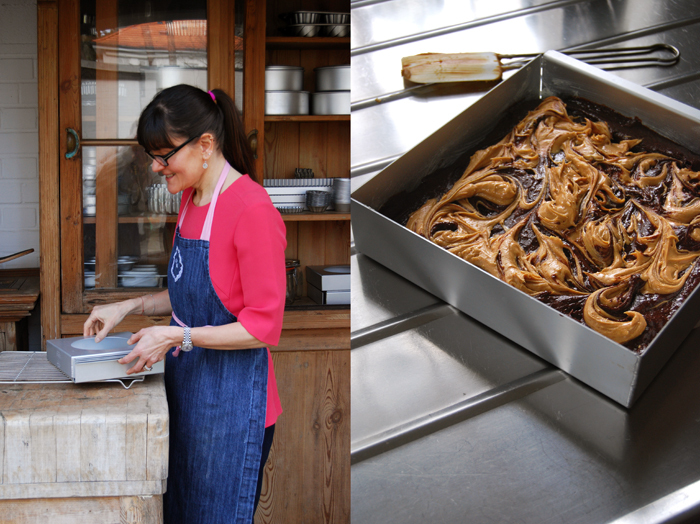 I felt so excited to visit her creative space, this culinary laboratory where all the Barcomi’s magic starts. Her private kitchen is equipped with five ovens, a dream collection of tins and pans, and in the center of this baking heaven stands Mrs. Cynthia Barcomi. She’s so chatty and relaxed that one can easily forget that she runs more than a café and deli, she also has a catering company, has written five cookbooks, presents a TV show, and on top of all this, has brought up four children together with her husband. She seems like an endless source of energy and positivity, focussed without forgetting to enjoy her journey, this woman is truly inspirational! Before we met, Cynthia asked me which of the recipes from her new Cookies cookbook I would like to bake with her. The choice wasn’t easy! 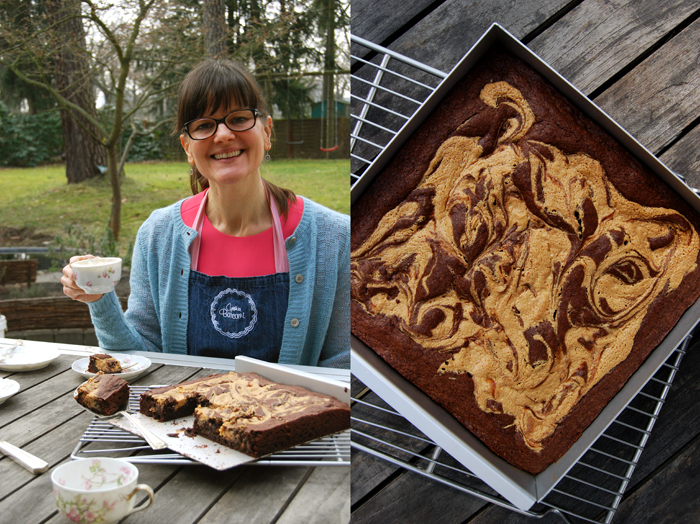 I was torn between Lemon Lime Cashew Shortbread, Chestnut Flower Brownies, Toffee Crunch Bars and Pesto Twists, but when I spotted her Peanut Butter Brownies I couldn’t resist, I had to try them. The creamy, buttery, salty and chocolaty voluptuousness literally jumped out off the pages of her book and I wasn’t surprised at all that they tasted exactly as I expected. 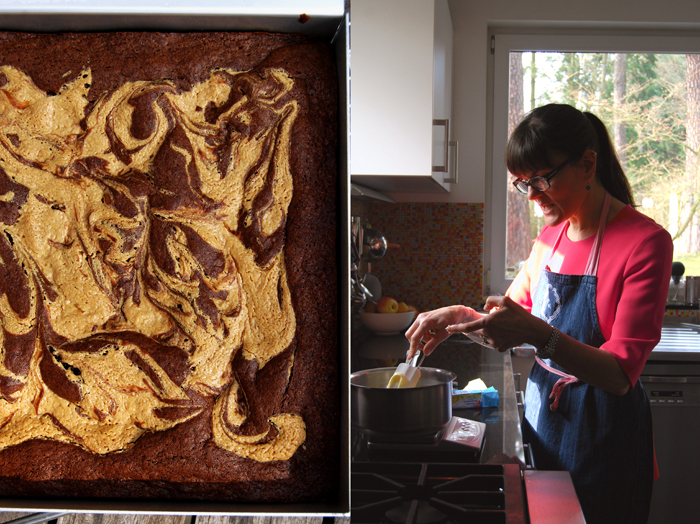 These brownies were deep and rich, addictive after the first fudgy bite – I just love this woman and everything she creates in her kitchen! 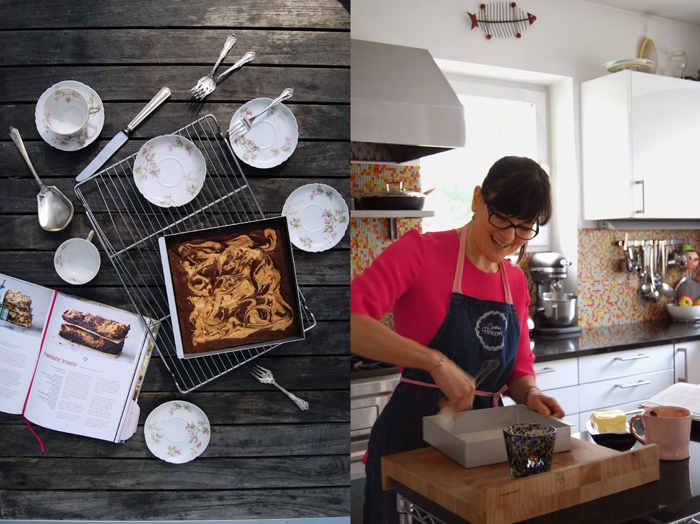 If you want to find out more about Cynthia Barcomi, the Barcomi’s cafés and her new book Cookies full of deliciously tempting recipes, click here! Set the oven to 175°C / 350°F (fan-assisted oven) and butter the baking tin. In a sauce pan, melt 125g (4 1/2 ounces) of the butter and the chocolate. Pour the melted chocolate-butter mixture into a bowl and mix with the sugar and 1 tablespoon vanilla extract. Let it cool for about 15 minutes. In a bowl, combine the flour, cocoa powder, 1/2 teaspoon salt and the baking soda. In another bowl, mix the peanut butter with 30g (1 ounce) butter, icing sugar, 1 teaspoon vanilla extract and 1/4 teaspoon salt. Whisk the eggs into the chocolate-butter mixture and gently stir in the dry flour-cocoa mixture. Pour the dough into the baking tin and even it out. Place the peanut butter mixture in dollops on top of the chocolate dough and swirl it a little with a tooth pick. Bake in the oven for about 23 minutes or until just firm on top (don’t overbake!). 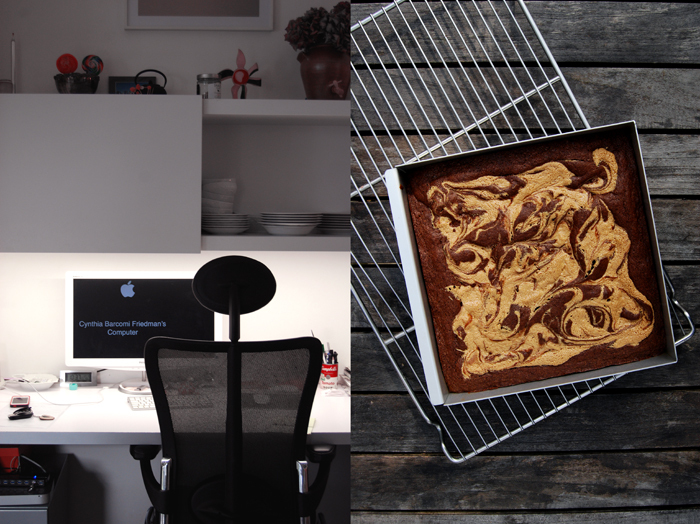 Let the brownies cool on a wire rack. You opened your first Barcomi’s in Berlin in 1994, the second one, a deli, in 1997. You also started roasting your own coffee beans, long before this café culture was popular in the city. How would you describe Berlin’s café and restaurant scene in those days? What changed over the years? In 1994 and up until a few years ago, there was really no alternative to industrial roasted coffee beans and industrial produced pastries in Berlin except Barcomi’s. Everything tasted the same and bad! Bad food and coffee corrupts the palette so that at some point, people no longer know how real food and coffee should taste. I have always seen my work as an alternative to the industry – be it feeding our guests or writing books, so that people can bake and cook successfully themselves. You came from New York to Berlin, arriving as a dancer, and today you’re one of Berlin’s most popular personalities in the culinary landscape. What led to this personal transformation? 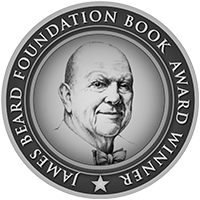 Hard work and a lot of self-criticism let to my success as a gastronome. The transition from dancer to gastronome to cookbook author was simple: I felt inspired and used that inspiration as my starting point. I have never looked back! How much of the New Yorker is still in you, how would you describe it? What do you miss about this city? New York is a magical (and tough) city. It is an extremely competitive and fast moving city and if you live there, you have to keep up! Living and going to school there taught me not to be afraid of competition by always doing my best and remaining true to my ideas and beliefs. As a writer of five cookbooks, a TV personality, caterer and restaurant owner, which of your activities relaxes you and which challenges you the most? It is always challenging to be good and it’s always challenging to work with lots of people, I have 50 employees between the two stores. I love it though and I simply love to cook and bake. It relaxes and focuses me so I can let the creative process unfold. You just published your latest book COOKIES, how do you develop new recipes, where do you find inspiration? Inspiration is everywhere: ingredients, shapes, colors, occasions, dreams, sense memories just to name a few. Inspiration is always the starting point for a new recipe and without it, I cannot create. A baking recipe begins as an intellectual theory of a bunch of ingredients. The magic happens, when I synthesize theory with practice (baking). This involves all of my senses and is partially an intuitive process. When a pastry finally comes out of the oven, theory and practice have united – I love it! I love the people in Berlin. It has become a really exciting city because the people living here are busy making things happen. Whether music, the arts or the food scene – it’s happening in Berlin! Actually I find visual artists and music composers inspiring in the kitchen. Layers and layers of details like shapes, juxtapositions, harmonies remind me of the intricacies of my own work. You brought up four children together with your husband, one of your daughters joined your catering business, how much family is there in Barcomi’s? There is a lot of family in Barcomi’s. My husband and son love to do the store deliveries on Sundays. My youngest daughter is a great helper / baker in the kitchen. Barcomi’s is my family’s existence as well as the existence of many co-workers of mine. I used to bake when I was really young (3 – 4 years old) but cooking? I started making omelettes for my parents when I was…maybe 10 years old. Then I discovered Julia Child, Mastering the Art of French Cooking. The floodgate was opened! I love to shop at the weekend market at Mexikoplatz. There is also my favorite farmer who sets up a stand a few days a week at the corner of Sven-Hedin Strasse. I’m originally from Washington, which means that I know my apples. This farmer has the BEST apples I have eaten outside of Washington! 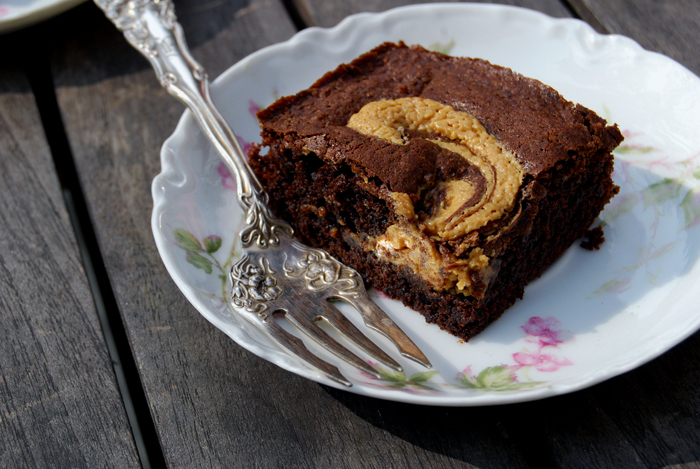 Peanut Butter Brownies (from the new Cookies book). 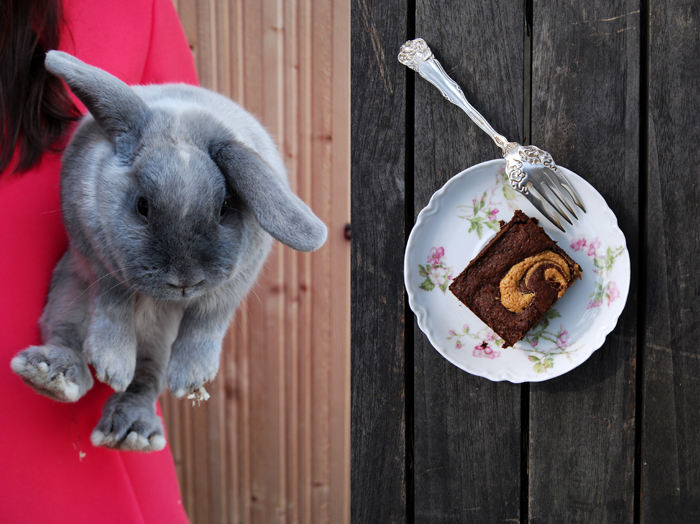 I really love your work, Meike: it is detailed, honest and personal. 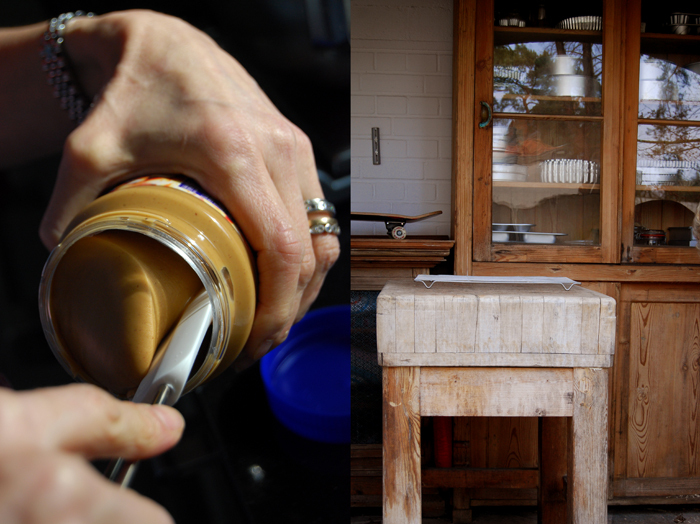 There are many blogs out there, but so few capture the essence of food like eat in my kitchen. I’m impressed! I would like Jean-Georges Vongerichten to cook his favorite meal for me… or Nobu Matsuhisa, I love his food as well. It is one of my favorite things to do: open my cupboards and simply throw a meal together (often in less than 30 minutes!). As my husband would say, I have done some of my best work in the least amount of time. I love the flow of improvising in the kitchen. It would be my dream TV show to go to someone’s home, open up their kitchen cupboards and cook an amazing meal! Well, I do love chocolate chip cookies but my taste has also evolved over the years. I really love to make and eat simple, straightforward foods. Fresh herbs, seasonal and regional produce is simply the best. I have a rather large kitchen at home with many ovens and lots of work space. One of the most important elements of my kitchen is the DOOR. I love to cook alone, by myself. It’s like painting to me and it is not necessary a collaborative process. It is a moment, THE moment. Well, I like to plan a meal for a special occasion as well as the challenge of an impromptu get-together. They are two very different disciplines, each one off-sets the other! Unfortunately i missed my chance to meet Cynthia in the real life, when she was in Düsseldorf for a book-signing. The weather was so bad and i always go by public transport, so i had to decide to stay at home. I hope i can travel to berlin this year and perhaps there will be a very little chance to see Cynthia at her cafe. Hi Sonya, just check her Facebook page, maybe she’ll come to Düsseldorf again at one point! Good luck! Hi Meike. I always check Cynthia at facebook, there i saw also the link which showed me your page (what a luck!). I hope she will come to NRW soon, perhaps in my town Dortmund, but i don’t think this town is interesting enough ;). But Düsseldorf is not far away, not like Berlin. I’m a great Cynthia Barcomi fan and it was a pleasure to read your text and look at this wonderful pictures. When i first hold the new book in my hands i could not decide which will be the very first i will try. 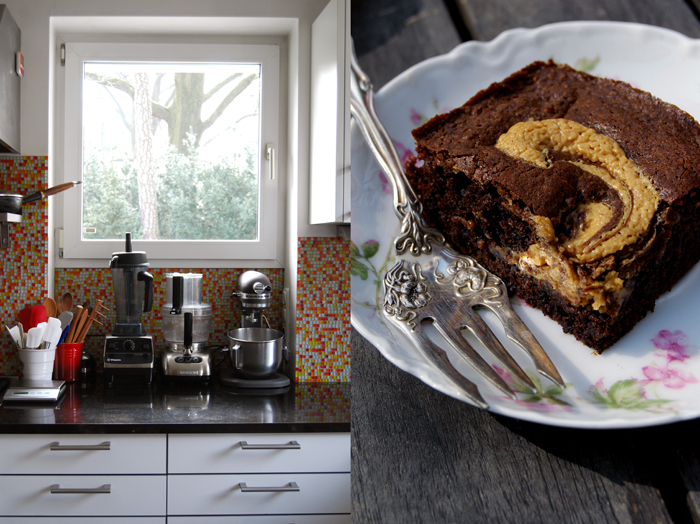 But then i saw the peanut butter brownies and i suddenly fell in love and after trying them i can say: absolute delicious and so beautiful!! !